(CNN) - As teams frantically searched areas of Southern California smothered by rivers of mud and boulders, officials on Thursday increased the size of the evacuation zones. The immediate areas where at least 17 people were killed are under mandatory evacuation, Santa Barbara Sheriff Bill Brown said. "We know that this a terribly inconvenient development but it is also incredibly necessary," Brown said to residents. The number of people missing in and around the oceanside community of Montecito was in flux Thursday. At an afternoon news conference Brown said as many as 43 people could be considered missing. "It doesn't mean that they (the 43 people) are all actively missing," he said. Thursday morning the total was reported as 48 then revised to eight due to a "clerical error," according to the sheriff's office. Brown said he still had hopes people would be found alive as the search moved into its third day. • Victims list: Officials have released the names of the 17 people killed. The victims ranged from 3 years old to 89 years old. • Deadly storm: All the deaths were reported in Santa Barbara County, authorities said. An additional 28 people were injured in the county. • Destruction: At least 65 homes and 462 other residences were damaged in Santa Barbara County, spokeswoman Susan Klein-Rothschild said Thursday. Eight commercial buildings were destroyed, and 20 were damaged. • Search: Crews had completed a primary search of 75% of the debris field. • Weather conditions: No rain is forecast for the area over the next seven days. High temperatures are expected to be in the upper 60s to mid 70s from Thursday through the weekend. • Road closed: Sections of US 101, a major thoroughfare connecting Northern and Southern California, are closed until Monday. Anxious residents have been awaiting word on their loved ones. On Thursday, Brown said the searches may take weeks. "This entire area is a very active rescue and recovery and repair zone right now," he said in announcing the new mandatory evacuation boundaries. He said the zone, which includes areas formerly under voluntary evacuation advisories, would be in effect for one week, but residents should plan for two. There were a "number of significant rescues," Brown said. In Montecito, rescuers have been tearing through mounds of mud, furniture and fallen trees to search for those trapped. Some received good news of disoriented loved ones rescued from the roof of their muddied, flooded home. But others were not so lucky. Diane Brewer said her friend, Josie Gower, 69, died after she opened her door and was swept away by the mudslide. "It was always a full life with Josie. Now, it's just a hole," she said. Catholic school founder Roy Rohter, 84, and his wife, Theresa, were swept from their Montecito home. Rohter died, but his wife was rescued, said Michael Van Hecke, headmaster of St. Augustine Academy in Ventura, which Rohter founded in 1994. Rebecca Riskin, the founding partner of Montecito real estate company Riskin Partners, also died, the company said. Riskin began selling real estate in Los Angeles and moved to Montecito nearly three decades ago. Her loss is "incredibly devastating to her friends, family and our community," the company said Wednesday. Authorities have not released the names of the missing, but some of their relatives have confirmed their identities. James and Alice Mitchell, an elderly couple from Montecito, are among those missing, their granddaughter, Sarah Weimer, said Wednesday. Billy Grokenberger lived in a part of Montecito that was under a voluntary evacuation order. He and his parents put belongings in their three cars, in case they decided to leave before the storm. They didn't. "We had thought about leaving, but we had just had the fires ... we didn't take it serious(ly) enough," he said. On the morning of the storm he woke up to the sound of thunder and went downstairs. 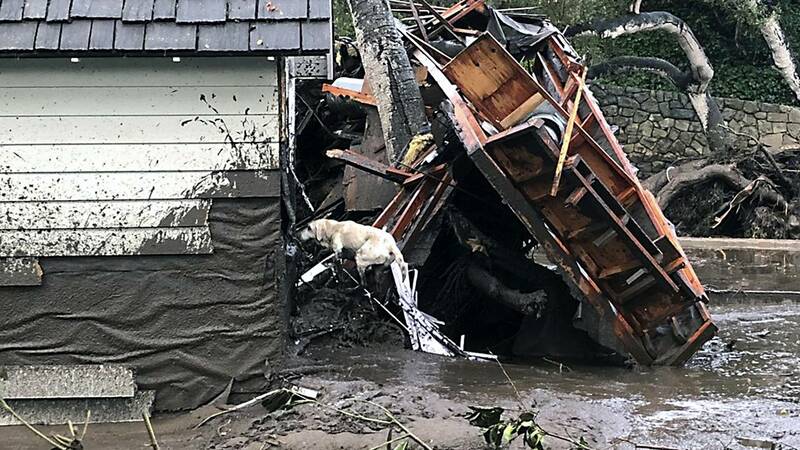 About 30 minutes later, he was watching 2 to 3 feet of water streaming down the street when he looked over to the sight of the neighbor's car blasting through a stone wall that surrounded the property. "(In) four minutes the water was through our wall and in our house, almost to the second story," he said. His neighbors' house and others were swept away, as were two of the Grokenbergers' cars. Their home cannot be saved. "The house is destroyed, but you know, there's just so many others who are less fortunate. But we just feel lucky that we were able to get out and (are) alive," he said. With blockages making driving difficult, some are hiking or biking to work -- including staff at a Montecito retirement home, CNN affiliate KEYT reported. With parts of US 101 closed, motorists moving up or down the coast must choose between time-consuming alternate routes. Some will drive inland to access Interstate 5. Others are taking boats between Ventura and Santa Barbara to get around the closure. Some companies were offering ferries about four times a day, carrying roughly 400 people daily, CNN affiliate KTLA reported. Burbank, just north of Los Angeles, also had problems with mudslides. One resident of the town, whose escape in a Prius went viral after firefighters posted a video of it, told KTLA he didn't think he was going to make it. Desionne Franklin told the station that his housemate told him about a mandatory evacuation. So he and he girlfriend dug out the driveway and he eased down the road at first. "When I got halfway down the hill, I just felt this burst of water hit the back of the car," he told KTLA. The Toyota hydroplaned the rest of the way down the hill, he said. "I guess this is going to be it for me, right here," he said he thought, but the car got traction just in time to avoid a crash. The Thomas Fire -- the largest wildfire in California's recorded history -- has burned more than 281,000 acres in Santa Barbara and Ventura counties since it began in early December. It's still burning. And because of the fire, communities below the scarred terrain could remain at risk of mudflow for a few years, said Randall Jibson, a research geologist with the US Geological Survey. "(But) no storm brings down everything that is susceptible. There's almost always more" that could come down, he said. Mudslides are not uncommon to the area. In January 2005, a landslide struck La Conchita in Ventura County, killing 10 people. CORRECTION: This story has been updated to reflect the latest number of missing in the mudslides. An earlier report of 48 missing was a "clerical error," according to Santa Barbara County officials.